I dedicate this article to all the 37/10/1 Lifepaths out there. Also, to anyone who has a 37/10/1 Lifepath as a parent, partner, colleague, friend or child – may this post bring you peace. When given space, 1’s are Angels in human form. Miten(Deva Premal & Miten) – Your music and words give me life. Francesca (Francesca’s Flowers) – Star Sister, I love our connection. Kerry Harmanis (Mindful Meditation Australia) – Thanks for your light. Leanne (The Barefoot Medium) – I truly admire your free spirit. Rory Bland (The Wholefood Dude) – Your courage and wit rock. Matt Roman (Piefection) – Hey mate, your pies are arty banquets. As I wrote in your personal 2017 forecast, we’re in a Universal 10/1 Year of New Beginnings in Numerology. Words like OM add to 10, as does MAN. 1 is about healing our Root Chakra, oneness and family tree healing(see this article on forgiveness). This is a time of fresh starts for all 6 billion of us. The Earth has never needed healing so much. It’s time for males and females to unite, instead of fight. In Eastern philosophy, everyone is a mix of Yin (feminine) and Yang (masculine) energy. In the West this is similar to the ‘division’ between heart and head. At its best, Yang brings fire, determination and safety to our lives. Too much Yang, results in an over-emphasis on goals, logic and violence to divide and conquer. It puts us in a fear-based survival mode. At its best, Yin brings flow, compassion and trust. Too much Yin, results in emotional chaos, over-responsibility and martyrdom. It means we become victims, with no energy, time or money to defend ourselves. So you can see, balance is key. Too much action = Yang overdrive. Too much thinking = Yin overload. It’s only when we act boldly with conscience, that the world will start to change. As you may know, I mainly profile living stars (see famous people’s readings). However, as my career grows, I’ve been attracting more fans AND more critics, be they facebook trolls, ex-clients, or weirdos who SMS at night. This flak has been hard to handle, as I’m naturally a quiet, Yin personality. 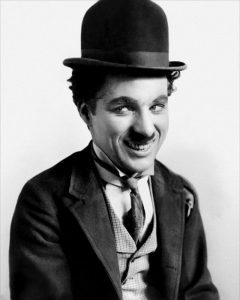 To stay well, I’ve been seeing life coaches and healers (Elissa Freeman, Shaun Price and Alfina Lofaro) and studying courageous Souls like Charlie Chaplin. Recently, I watched the 1992 film Chaplin, starring Robert Downey Jr., a 29/11 lifepath like me. Wow. Instant tears! Charlie’s Mum was mentally ill, his Dad was an alcoholic, and he came from extreme poverty. Yet he rose to the top against the odds, to become an activist and performer. So I know I had to share his numbers with you. Even as I type, I can see his face and feel goosebumps. Good sign. 1) He was born to be one of a kind. Charlie arrived on 16 April 1889, making him a 37/10/1 Lifepath in numerology. Find your lifepath. I call the 37/10/1’s Intellectual Pioneers, who often become known for their work (think Napoleon, Lady Gaga and Julia Gillard, Australia’s first female Prime Minister). They are less aggressive and more ethereal than 28/10/1’s. 3, or Solar Plexus Chakra energy is about birthing ideas and speaking up, while 7, or Crown Chakra energy gives a direct link to Source and spiritual truth. Listen to Deva Premal & Miten’s song Shine Your Light for 1 energy at its best – pure compassion, and gratitude for the gift of life. Not only did Charlie achieve wealth, love and fame, he made the first Hollywood film denouncing Hitler, called ‘The Great Dictator’ in 1940, despite terrifying opposition (he was placed on a death list). Can you imagine the pressure he faced? History would prove that Charlie was right and his critics were terribly wrong. Hitler was a psychopath. 2) Charlie’s name granted him unusual sway over women. In numerology, your name influences 30-40% of your destiny. See the system I use. Charlie’s birthname, Charles Spencer Chaplin, adds to 101, which reduces to a 2 Destiny, aka The Peacemaker. I rarely see 2 Destinies in the spotlight, as they are happiest behind the scenes. If they achieve stardom, it’s through partnerships and nurturing others. Fortunately, Charlie’s brother Sydney was a 32/5 Rebel lifepath, making him a brilliant promoter and manager during Charlie’s career. Your name tells me how you make a name for yourself. That’s why, when women change their names after marriage, their career aspirations can vary. This is something I discuss in all my psychic readings and numerology workshops. Charlie’s 2, or Sacral Chakra Energy meant his career was based on feeling, intuition, observation and sensitivity. Talk about inner conflict! Charlie was juggling a masculine/ Yang 1 lifepath with a feminine/ Yin 2 name. In his case, the clash created a deep thinker, who appealed to all people. Charlie’s chart lacks 2 (Mother/ Feminine) energy, indicating a great wound here. No wonder he was a workaholic – his career brought him closer to his mum, who, despite being insane, was a singer (2 energy is musical). I guess, another ‘bonus’ of his long working hours was all the women he met. 3) He was destined to be a child star. We all have four seasons of life in numerology (called pinnacles and challenges). Charlie’s first season was ruled by 2 energy, suggesting he’d find his calling early, due to his 2 Destiny. Sure enough, he was on stage at age five, filling in for his mother when her confidence failed. Can you see why I love numbers? As a professional psychic, I assist hundreds of clients a year to heal their careers, relationships and confidence, based on their specific charts. It’s a priceless gift to discover your purpose, especially if you’re at a major turning point. 4) Being born on the 16 of the month gave him challenges in love. See my article on karmic debt numbers. At times, Charlie was too headstrong and used his free will (1 or Root Chakra energy) to close off his mind and higher vision (6 or Third Eye Chakra energy). As a result he was inconsistent in relationships until his fourth marriage to Oona O’Neill. They had eight children and were married for 34 years, in stark contrast to his first three partnerships. Words like PATIENCE add to 37/10/1 (see my system), so part of Charlie’s lifepath was to learn cooperation. I’ve met many 37/10/1’s who are late bloomers, needing time to settle down. Who are we to judge? Surely, it’s better not to skip steps. You can’t rush a pregnancy, isn’t marriage just as important? Perhaps Charlie chose a 37/10/1 lifepath to resolve his past-life issues around intimacy. This would make sense, as we often repeat our karmic patterns before healing them. Dan Millman’s description of 37/10/1’s in The Life You Were Born to Live mentions Tantra. Interestingly, Deva Premal and Miten (another famous 37/10/1) run Tantra retreats. I personally found Tantric/ sacred dance with Holly Wodetzski helpful for falling pregnant and healing my relationships. Tamika Hilder is another Tantra teacher in Australia I recommend. BTW, ALL karmic debt can be overcome – it’s like a credit card, you need to face the challenge, instead of avoiding your healing. I have a 13 karmic debt (hiding vs sharing my wisdom), which makes writing feel like open heart surgery at times. That’s why I keep blogging, because it’s better than getting a sore neck, stomachaches and laryngitis from censoring myself. More on healing the Throat Chakra. 5) Charlie’s chart shows a peak at 36-37 years old, because he was a 37/10/1 lifepath. Your lifepath is a key period of wake up calls*, e.g. I am a 29/11 lifepath who found numerology at age 29. Find your lifepath. At 36, Charlie released The Gold Rush, one of the highest-grossing films of the silent era. He said “this is the picture that I want to be remembered by”. I love his ‘Dance of the Rolls’ – see the video. By 37, Charlie had divorced his second wife, Lita Grey, and given her $600, 000, the largest cash settlement in American history. Charlie went through a total rebirth at his lifepath age. I had the same thing happen – perhaps you did, too? Like all 1 lifepaths, 37/10/1’s often go through life and death crises to find their strength. They are Phoenixes who rise from the ashes. Only God can stop a 1 lifepath who’s on their purpose. They are single-minded and manifest opportunities with ease (no wonder the number one card in the Tarot is The Magician). *Sydney Chaplin, Charlie’s brother, was a 32/5 Rebel lifepath. At 32, he negotiated Charlie’s first million dollar contract in the movies. Similarly, author J.K. Rowling’s first Harry Potter book was published when she was 32, and she’s a 32/5 lifepath. Ellen Degeneres first came on TV at 32, and she’s a 32/5 lifepath. DON’T MISS PART TWO OF CHARLIE’S NUMEROLOGY! I’ve posted it in a second article for easier reading. -Write me feedback below! Comments will be published once they have been approved. Or, for greater clarity, book a phone or Skype reading with me to discover your soul contract and 2017 forecast. My current waiting list is 6-8 weeks for new clients. it’s worth the suspense – see previous clients’ feedback. I’m teaching numerology workshops and palmistry workshops in 2017 – bookings are now open.